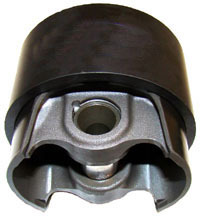 Stop struggling to install your Textron / Weber pistons! The Installation sleeve eliminates all the hassle of compressing the rings into the bore, and removes the possibility of forcing a piston into the block with a misaligned ring. Set your ring-end gap, rotate the rings to their correct location and simply push it into the bore! The WE-85 is for the OEM Weber bore size. The WE-88 is for the 799.74cc kit. WE-89 is for the MPE-850 standard bore diameter.